I never planned to go over three years without running a marathon. I didn’t know in 2014 that crossing the Missoula Marathon finish line, my second marathon in nine days, would be my last for a while. Two kids later and that’s my story. With plans to cross another state off of my goal to run a marathon in every state coming in September, I’ve decided to use 2017 as a year of regaining fitness and strength. 2017 will be a year to return to the basics. Since it’s been a while since I’ve trained for and ran 26.2 miles, I’m going to start small, build strength and endurance, and work up from there. I’m going to train for a 10k first, something I’ve never done before (the training part). I know I could run this distance without following a plan, but I want to slowly increase my mileage while letting myself recover from having a baby even more. I wanted a plan that would slowly add in miles and balance cross training. After completing my 10k plan (8 weeks), I will reevaluate and select a half marathon training plan (12 weeks) and then a marathon plan (18 week). The 10k plan has me running three days a week, which seems perfect for right now. I will add in more days as it seems to be appropriate. Hal’s plans are so customizable and adjustable for every runner’s ability level. I’ve used many different plans in the past, but often come back to his. His plans make it possible to adjust midway through to a tougher or easier plan if needed. I’ve always liked the way a training plan simplifies the process of reaching a distance goal and have used many different versions. I like being able to look at my plan and know what to run and how without having to put too much into organizing these details. There are so many training plans out there that I don’t need to create my own. The plan I’m following lets me choose my cross training, which gives me plenty of personalizing (and I’m so excited to mix it up with some fun workouts). Right now my life is chaotic to say the least so looking at a piece of paper and seeing what my workout is for that day is what I need. Being able to rearrange days is also essential as my days don’t always go as planned. My 10k plan started last week and will last 8 weeks. Because gaining strength all over and remaining injury free is my goal, I’m following a novice plan with cross training days being essential. On cross training days I will continue my workout DVD’s (Knocked Up Fitness and Katy Bowman are a couple I use) and DR exercises from Katy Bowman’s book Diastasis Recti and several I’ve found online. Cross training will remain a key part of my marathon training. As I progress in strength and fitness, I will add more running and speed. I also plan to change-up my cross training as my DR closes. It’s been nearly 4 years since I trained hard for a marathon. I missed qualifying for the Boston Marathon by 1:36 at the RnR Arizona Marathon in 2013. Since then I’ve had two babies, which has made it difficult for me to remain committed to my training. I plan to revisit this goal when I’m in better shape and have more time to devote to it. Three years is a pretty large gap in marathons and my body is in no shape to be chasing after a PR. My training will reflect that. There will not be many speed workouts or tempo days. You won’t see multiple high mileage weeks in a row. I won’t be doing several 20 milers or more. There will not be two runs in a day. You will see rest days and a gradual increase in miles. My training plan will in a way follow my baby getting older. I like that this should prevent me from becoming too overwhelmed and make my small goals lead to accomplishing my big goal. It really takes the pressure off and lets me enjoy being a mom while letting me do what I love. It should also set the stage for advancing my training the next marathon cycle. Why I thought jumping into a marathon training plan after my last baby was the only way to go I don’t know. This time I feel so much more confidant in my ability to do this largely in part to the progressing plans plan I have. When choosing a training plan the most important aspect to consider is how it will fit into your life and your current fitness level. If the miles and workouts don’t match your current life (fitness level, demands outside of running, etc. ), then you will have a really hard time succeeding. Even with the perfect plan will it still be hard? Yes! Will balancing training, working, being a mom and breastfeeding still be overwhelming? I have no doubt! Will some difficult choices and sacrifices have to happen? You bet! Will it be worth it? Of course!! If you’re returning to running in any capacity (new, former, had a baby, kind of been slacking) this is a perfect goal for 2017. Join me in reaching your fitness goals by starting small and working your way to your big goal for 2017. I will be documenting my training here and on Instagram (sneaksandstilettos) to help myself stay accountable and hopefully get some of you to go after your 2017 goals. We have to start somewhere; let’s start small. Baby steps! 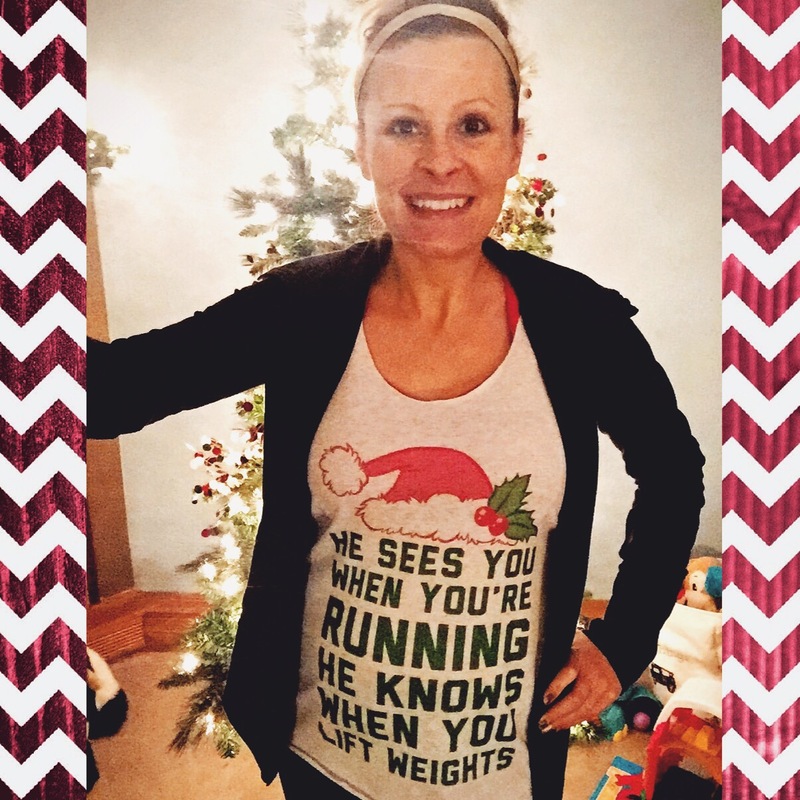 Because he sees you when you’re running and knows when you lift weights! I’m talking about Santa of course. At five weeks post-partum I thought I’d be so much further along in my journey back to fit. Last post-pregnancy I’d walked 100 miles with my son and had ran 2-3 miles at a time on a few occasions at this point. Each pregnancy has it’s own healing timeline, but I’m still bummed. Other than what feels like a longer recovery, my biggest challenges have been having two little people to care for and one of them always needing something, cold winter temps making it hard to get the smallest one out on walks as of late (Getting out isn’t hard, it’s the what if she wakes up and needs to eat or wants to be held and it’s so cold. She is kind of unpredictable and doesn’t love her car seat.) and feeling frustrated with not running more because my body isn’t completely ready yet. Getting motivated to run is much easier for me than walking since running is what I love. Trying to make myself be excited to walk inside on a treadmill…even harder for me. Anyway enough with the “reasons.” I really want to have a great fitness month in December and I’m sure some of you would too. With holiday treats and events there is even more reason to stay active. Plus I love working out to some rockin’ holiday tunes and getting in a run (or walk) that takes me past holidays lights. So here is my challenge! I’m challenging myself (and you) to get in 30 minutes of physical activity everyday through New Years Day. What counts? Anything that is physical activity. I will be walking, hopefully running, 21 Day Fixing, doing post-partum workouts, and hopefully attending a class or two. There are no mileage requirements, paces to reach, weight limits to break, just doing an active activity you like. Why wait until the New Year to get in shape and feel good about yourself? Of course accountability is a must. I want to do this, but it’s not enough just to want it. 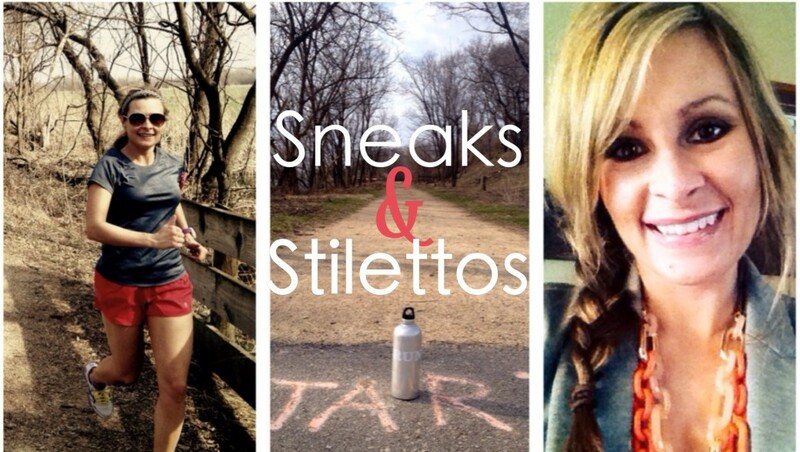 I’ll be posting a photo a day on Instagram (sneaksandstilettos) to hold myself accountable. Join me if you need some accountability. I will be using the hashtag #heseesyouwhenyourerunning since that is my true love and my ultimate goal to reach. I know on New Year’s Day I won’t regret my challenge and it is a great way to kick off any 2017 fitness goals you might have. Let’s hashtag away!